Ted Carmichael Global Macro: How Accurate are the Bank of Canada's Inflation Forecasts? How Accurate are the Bank of Canada's Inflation Forecasts? The Bank of Canada is an inflation-targeting central bank. It sets monetary policy with an objective of returning the inflation rate to the 2% target within six to eight quarters. Because this is the objective, the Governing Council of the BoC always projects that six to eight quarters from the current period, inflation will be 2%. If it did not do so, it would be admitting either that it cannot achieve the 2% target or that for some special reason it would not be appropriate to attempt to achieve the target. To my recollection, the latter has never happened. Four times a year, the BoC publishes the Monetary Policy Report, in which the Governing Council reveals its projection for inflation over the coming two years. The inflation projection is important because it shapes expectations about the likely future path of the Bank of Canada's policy rate. For example, if the current inflation rate is below the 2% target (as it is currently), but the BoC projects that inflation will return to the 2% target over the next six or twelve months, then there would tend to be an expectation that the BoC would reduce the amount of monetary stimulus over that period. One would expect that the BoC would be expert at projecting inflation. After all, the BoC undoubtedly has the largest number of highly educated economists of any institution in Canada and they are focussed on projecting inflation. The BoC has access to whatever resources are required, including model building capability, as well as input from top academic and private sector advisors. And most importantly, the BoC controls the monetary policy tools that can influence the inflation rate. 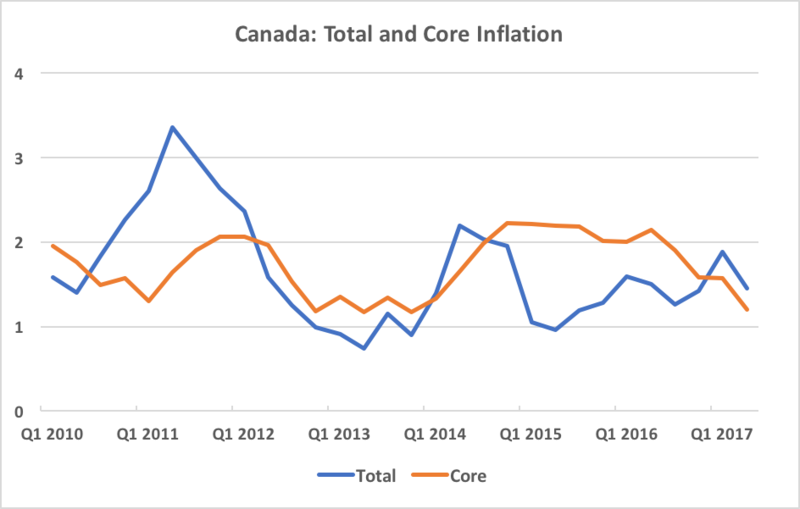 So it seems reasonable to ask the question: With all of these resources, with a strong government mandate, and with independent control of the policy levers: Can the Bank of Canada accurately project future inflation? To answer the question, we must look at the projections of inflation that the BoC has made. In this post, I review the track record of the current decade, starting in January 2010. This is the period following the Great Financial Crisis (GFC) during which Mark Carney and Stephen Poloz have been the BoC Governors. To conduct the review, I have compiled the projections of inflation made in each Monetary Policy Report since January 2010 and compared the projections with inflation outcomes one year later. I have reviewed the projection accuracy for both Total CPI inflation and Core CPI inflation. Shown below is the actual performance of total and core inflation, shown as quarterly averages since the beginning of 2010. Over this period, total inflation has averaged 1.66% and core inflation has averaged 1.73%. Total inflation was below the 2% target 70% of the time (21 out of 30 quarters) and core inflation was below the target level 60% of the time. Now let's look at how accurately the BoC Governing Council projected total and core inflation one year ahead. The charts below show the actual outcomes against the BoC Projections made one year earlier. 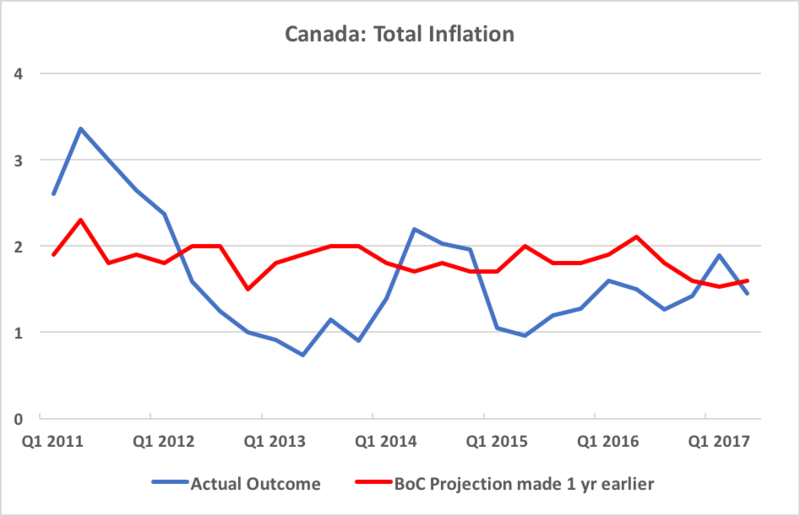 The chart for total inflation shows that the BoC consistently projected that inflation would return to close to 2%, while the actual outcomes varied significantly, between 0.7% and 3.4%. By my calculation, the average absolute error of the BoC's 1-year forward projections for total inflation has been 0.63 percentage points (ppts) which amounts to 38% of the average inflation rate over the projection period and 90% of the standard deviation of total inflation over the period. 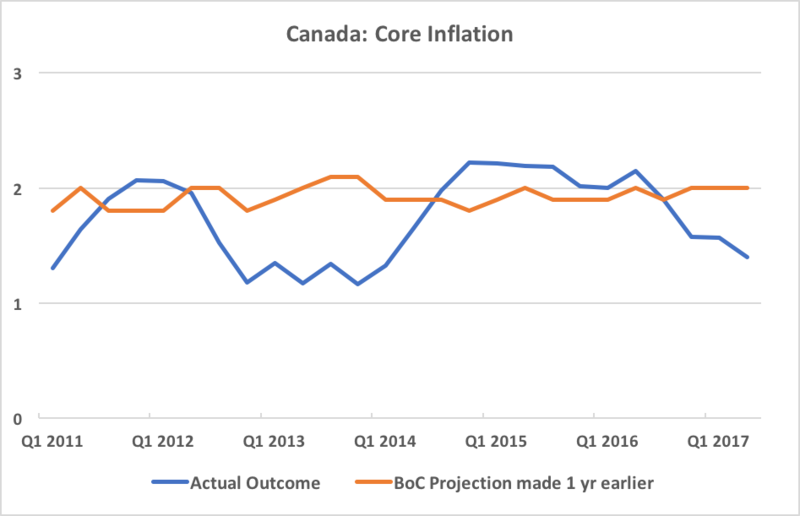 The chart for core inflation shows less variability in both actual outcomes and the BoC's projections. Since the January 2010 MPR, the one-year forward core inflation projection has never varied outside the range of 1.8% to 2.1%. Actual outcomes for core inflation have varied between 1.2% and 2.2%. 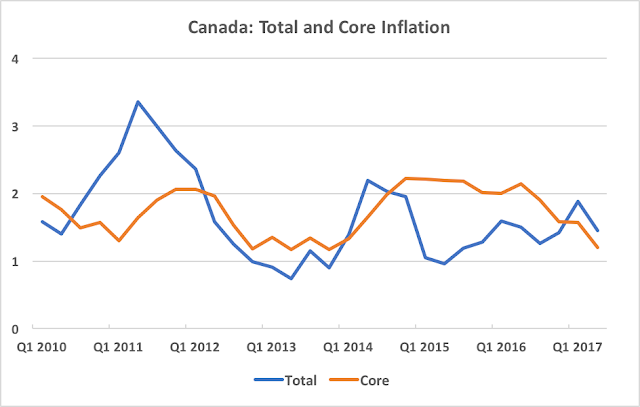 The average absolute error of the BoC's 1-year forward projections for core inflation has been 0.37 ppts, which amounts to 21% of average core inflation rate and 100% of the standard deviation of core inflation over the projection period. I conducted another test to compare the accuracy of the BoC's projections with those of a naive forecasting approach. The naive approach was to assume that total CPI inflation would revert to its rolling 10-year average over the 1-year projection period. The 10-year average of the total inflation rate has been falling consistently, from 2.1% in the second quarter of 2012 to 1.6% in 2Q17. 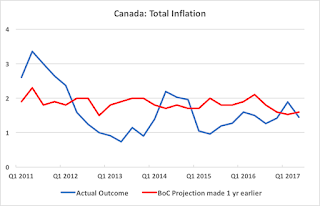 A naive forecast that total inflation in one year's time would be equal to its latest 10-year average would have produced an average absolute error or just 0.28 ppts, less than half of the error of the Bank of Canada's projections. You can be your own judge of these results, but from my perspective, the BoC's inflation projections since 2010 have shed virtually no light on where inflation was heading. A methodology that results in a projection error equal to 90-100% of the standard deviation of the indicator being projected is not of much value. It is a poor guide to setting monetary policy. The Bank of Canada is apparently not the only central bank that can't forecast inflation accurately. Brad DeLong, Professor of Economics at the University of California at Berkeley, recently took the US Fed to task for it's inflation forecasts. The Fed clearly needs to take a deep look at its forecasting methodology and policymaking processes. It should ask if the current system is creating irresistible incentives for Fed technocrats to highball their inflation forecasts. And it should ensure that its policymakers view the 2% target for annual inflation as a goal to aspire to, rather than a ceiling to avoid. There seem to be two parallel universes—one described by theory, the other by reality. Most of us occupy the latter, while the former is the province of academics and policy makers. In the theoretical world, low unemployment threatens to unleash a torrent of inflation, which needs to be staved off by tighter monetary policies. Back in the real world, disruption, innovation, and competition relentlessly drive down prices while wage growth is hard to come by. 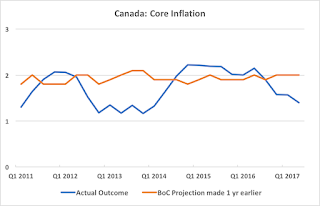 My own conclusion is that the Bank of Canada's projections of inflation are likely to be less accurate than the rolling 10-year average, which currently sits at 1.6%, below the BoC's inflation target. The recent musings of BoC Governor Poloz that signs of improvement in Canadian economic activity might merit the removal of some monetary stimulus represent a highly speculative view based on projections from output gap models that have not performed as well as naive rules. This implies that, for the Governor's view to be justified, either the BoC's forecasting record must suddenly improve or that the BoC must be more concerned about the potential risks to financial stability created by the extraordinarily low policy rate required for sustained pursuit of the BoC's 2% inflation target.